Do you watch “Friends”? Anyone? Remember that episode “The one with all the cheesecakes”? Briefly – a cheesecake was delivered by accident to Rachel’s apartment, and she and Chandler eat the whole thing. Then they order a replacement for the person it should have been delivered to. Well THIS is that cheesecake. It’s THAT good, Promise. It’s rich and creamy and spectacular! 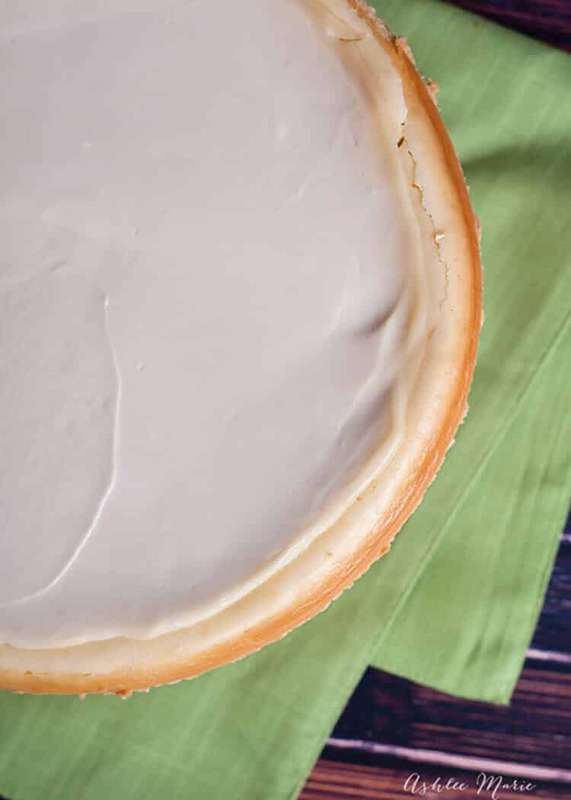 There are so many styles of cheesecakes, some have cream, some have sour cream, some use different cheese’s like ricotta, etc… This is not light, or airy like some, and if you prefer that style then this isn’t for you, but for me this is perfection. It cooks low and slow, doesn’t get overly brown, and has a great texture all the way through. The sour cream topping is optional, some would say it doesn’t belong on this cheesecake, that it’s more for NY style, but I love that BIT of tang to go along with this cheesecake, but it’s amazing without it too. My husband loves berry topping, I love it plain but to each his own! Cook your cheesecake until it’s still a bit jiggly in the center, like a loose jello jiggler, but not liquid, in the center 2-3 inches. It will keep cooking afterwards a bit, and IMO better to be slightly under cooked than overcooked. Press firmly into the bottom of a 10 inch spring form pan. Bake on the bottom rack until crisp and golden, abut 15 min. Beat cheese sugar and vanilla with electric mixer on med until light and fluffy, about 30-60 sec. Lightly whisk the eggs and yolks together and add to cream cheese mixture. Pour the filling over crust, bake on the center rack until golden, about 1 1/4 hours +. When you open the rack and shift the pan the center will jiggle a little, but not too much. This is the trick to learn, you might slightly undercook (not bad) or slightly overcook (okay) the first time as you get used to this style. Just the center 4-5 inches will jiggle and not like soup, like a loose jello jigglers. If you want the topping add it now. Turn the oven off and crack open the door and let the cake cool then refrigerate overnight, cheesecake tastes better after a day or two in the fridge. Return to oven for 5 min cool completely and refrigerate. I’ve been asked about waterbaths, I use one for my flourless chocolate cake so why not this? Honestly I don’t trust them with springform pans! I’m always nervous that it will soak into the cake/crust, And I’ve found that having the water pan in the bottom is enough moisture for my recipe. THAT said changes in altitude and humidity will effect this a bit, mostly cooking time. That is one THICK cheesecake! I want some right now! Pinned! Mmmmm There are so many different cheesecake preferences that I know it’s not for everyone but it is my absolute FAVORITE I’ve ever EVER had! I watch the cheesecake video it got my attention it looks so yummy but I never sent the recipe for it can you please send me the recipe for the perfect cheesecake recipe. The reason is because the ingredients in the video are not the ingredients in the post recipe Dense and Creamy Cheesecake. The video shows only 3 ingredients for the filling but the recipe shows add’l ingredients. The recipe shows vanilla wafers but the video shows graham crackers. So the recipe and video don’t match. The video shows cream cheese, sugar, eggs and vanilla just like the recipe calls for. And you can use graham crackers or nilla wafers, cookies or nuts in the crust. The best part about cooking from scratch is that you can personalize recipes to create anything you want! This is the base for all of my cheesecake recipes! This is hands-down the best cheesecake recipe I’ve ever made. It will be my “go-to” one from now on. There was no sinking or cracking in the middle after cooling. Thanks so much for posting! YAY YAY YAY! love hearing this, so glad you enjoy it as much as we do! Wow, that’s absolutely GORGEOUS! Like, seriously the most perfect cheesecake I’ve ever seen! It must be cheesecake season… pretty popular the last couple of days 🙂 Definitely pinning! Thanks so much! it’s funny how people think of the same things! I put off posting my granola because so many people have been posting it! Oh my goodness. This looks beyond amazing! I can’t wait to try it out! Thanks so much! It is seriously SO delicious! I have a ton of cheesecake recipes I need to post! it’s one of my favorite desserts! Do you have a passion fruit cheese cake recipe? Tomorrow I will be doing this recipe to see how it comes out! Thank you very much! ohhhh I have a triple citrus one, but not passion fruit, but I am working on a cheesecake cookbook right now and I’ll add this request to the list! WATCHED THE CHEESECAKE VIDEO . 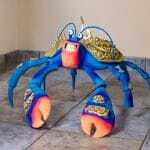 WHAT KIND OF MIER IS THAT ? LOOKS BETTER THAN MY KITCHEN AID . 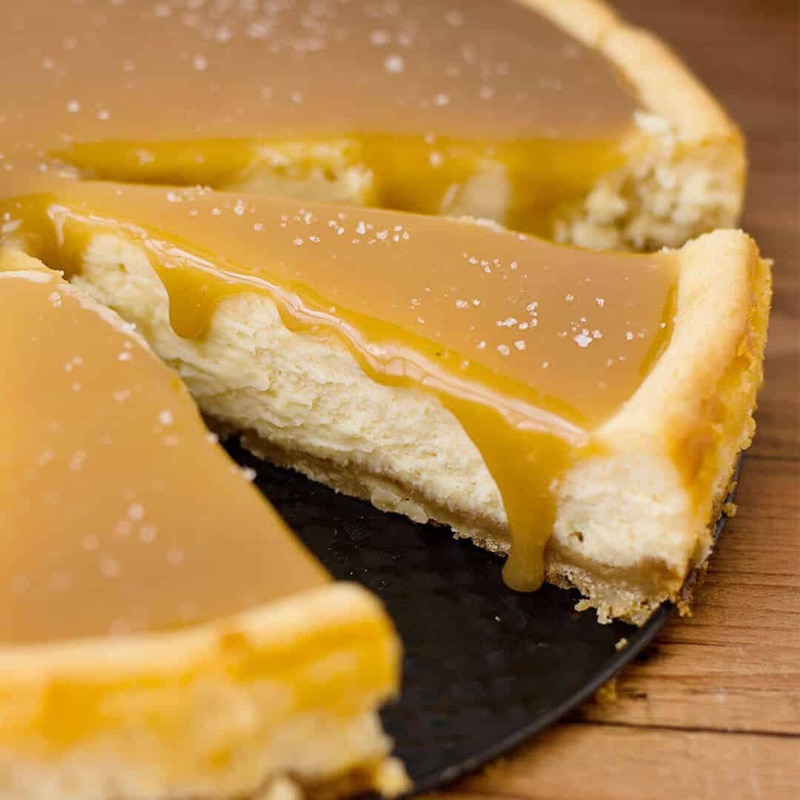 oh my goodness, everyone is posting cheesecakes lately and now I really want one/some. This cheesecake looks like pure perfection! 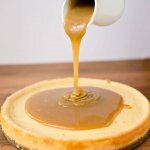 I haven’t tried my hand at too many cheesecakes, but your tips seem just perfect and I can’t wait to try this one! I hope the tips and tricks work! Let me know if you try it and what you think! That looks totally DREAMY! 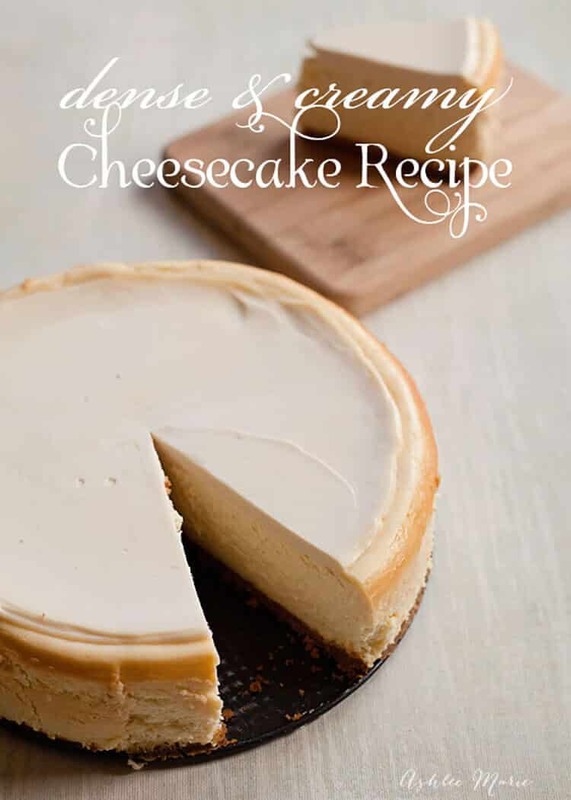 Can’t wait to give it a try – I love eating (more like devouring) good cheesecakes! Mmmmmm i wish I had some right now as I go through the commments! It is SO good! Great recipe – the ingredients are on my shopping list. I LOVE a dense cheesecake. 2. Toss lightly with fork until well blended. 3. Press firmly into the bottom of a 10 inch spring form pan. does it GET better than dense cheesecake? i think not! let me know what you think and how it goes! Wowza!! That looks fantastic! I am such a sucker for a good cheesecake. It’s def in my top 5 favorites! I’ll have to give this one a try next time Im ready to indulge! Mmmm. I saw this recipe and at 10:23pm on a Saturday night I am baking this cheesecake for my step-mother’s birthday celebration tomorrow…I will let you know what the family says..so stay tuned ! I can;t wait to try this !!! I can’t wait to hear what everyone thought! Not everyone likes their cheesecake as dense as I do! This looks AMAZING! 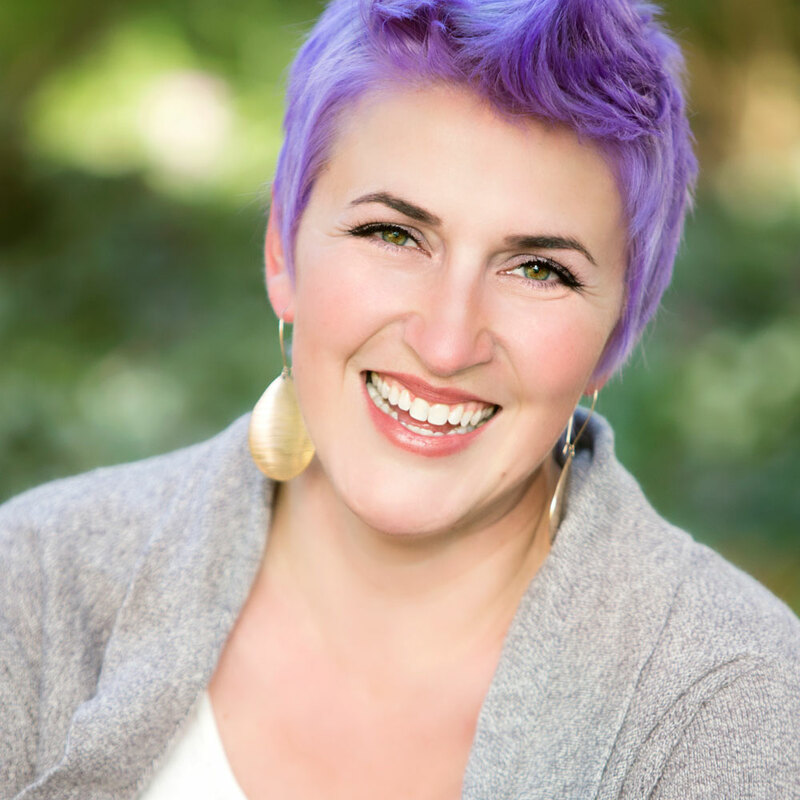 thank you so much for sharing (and blogging!! I love all you bloggers!!) I am such a sucker for cheesecake. I am making this for Easter dessert. 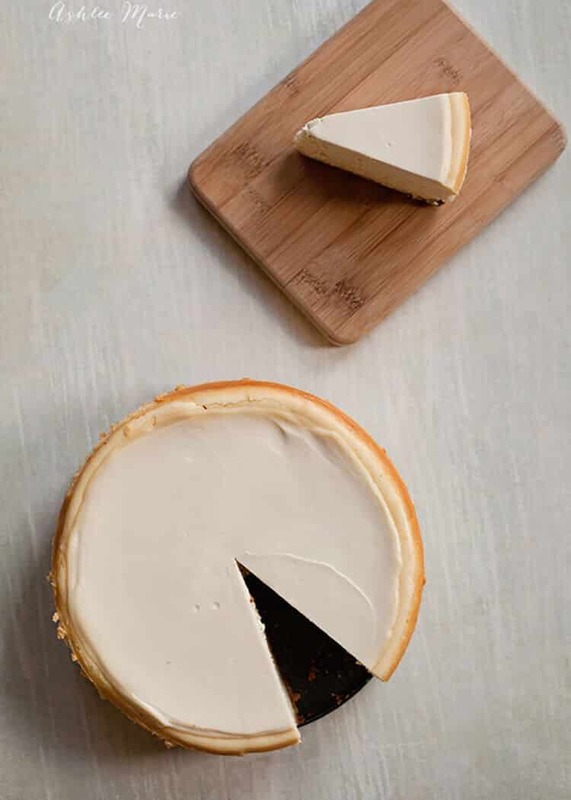 You have the topping listed as optional-does your cheesecake have this topping (in the pictures you have posted?) I would love for mine to look just as amazing as this! yes, the optional topping from the recipe IS on the cheesecake pictures! Did you make it? Did you love it? Hi, I love a dense and tart cheesecake. Do you think adding sour cream to this recipe will ruin the baking time or consistency? nope! it’s perfection! It’s a large, tall cheesecake, if your making a smaller version of course you’d use less. I’m pretty experienced with making cheesecakes. I recently moved to London, UK. In the States I’d use a gas oven and with water baths I never had issues with cracking. Here I have access to electric fan assisted ovens only. I lowered the temp 20 degrees (celsius.) Other than that I followed the instructions exactly. This was also my first time using a pan of water instead of water bath. I turned off the oven after an hour and let it cool for an hour. Unfortunately I got a deep “T” shaped crack right in the middle of it. I was apprehensive about the fan assisted oven from the get-go. Got any recommendations about using such an oven? okay, is there anyway to use the oven without the convection fan being on? most of the ovens here let you pick between conventional and convection. 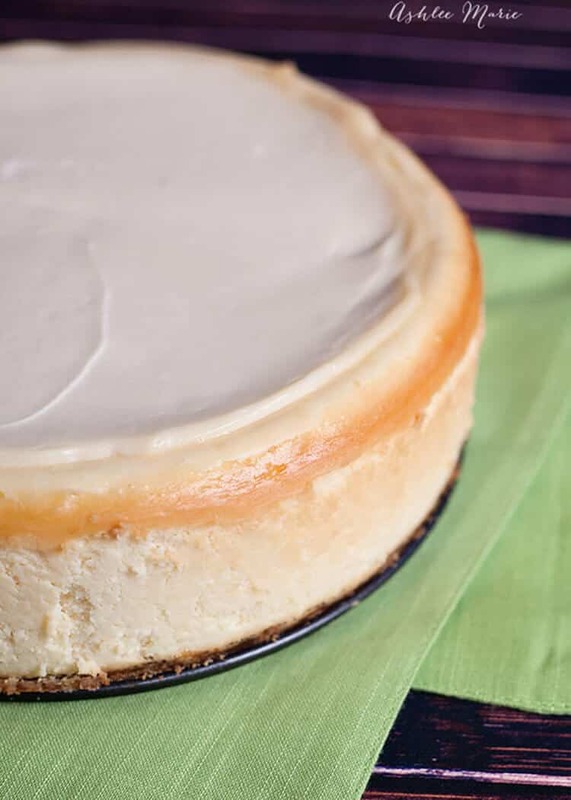 BUT if you can’t, convection ovens cook MUCH faster than conventional, like TWICE as fast (so 1/2 – 3/4’s of the time frame, or drop the temp by 25 -30 degrees), so your cheesecake would probably be done at about 45-50 mins rather than 1 hour 15 mins. But it will take a little testing to figure out. Also I’d def get an oven thermometer to check if it’s running too hot or on track. also because it cooks things more brown I’d consider covering the cheesecake for part of the time. I hope that helps! What would your suggestion be if i only have an 8inch spring form pan? I have used the exact recipe before with it and the center is just always too soft. I’d do 2/3rds of the recipe in that case, or you could try lowering the temp and looking longer to try to get through that HEIGHT without over cooking the outside. I made myself this cheesecake for my birthday. For the crust I only used the gingersnaps and I didn’t have sour cream so instead I sprinkled mini chocolate chips on top. But I followed the instructions for the cheesecake portion exactly and it came out amazing. The top was so perfectly golden and the cake so thick rich and gooey. Thanks so much! YAY! that makes me so happy! I’m so glad you loved it! Have you ever tried freezing this cheesecake? 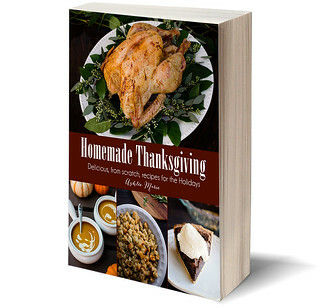 I want to make it ahead for Thanksgiving. It looks exactly like my husband is requesting. Thick and dense! yup, I slice it, freeze it then dip the slices in chocolate and eat it that way! mmmmm, I’ve never frozen the whole cheesecake, but I’d cool it , refrigerate it, then wrap it in plastic, then freeze it, let it thaw in the plastic so it condenses on the plastic, then unwrap and serve! Oh my goodness! This looks fantastic! Our staff was also curious about prepping it ahead of time. Can you freeze this cheesecake? I wouldn’t, the reason you use a springform pan is so that you can take the outside off and then easily cut the cheesecake. if you don’t have one I’d suggest a pie pan (but cut the filling recipe in half). if you used a pyrex dish you wouldn’t be able to get nice slices out, you’d just destroy the cheesecake trying to get it out of the pan. I am about to make this cheescake so first thank you!!!! Second could I press the crust along the sides as well becauseI like the outer crust on my cakes. So press the crust along the sides of the pan as well in an upward motion if that makes sense? Thx hun, looking forward to your respond so I can make. of course! I’d make a larger batch of the crust, like 1 1/2 or even 2 times depending on how high you want it. First thing I noticed was how you keep your kitchen, very organized, neat and clean, second was not using too much wares in prepping ( a +), and your vid presentation is excellently executed ( another +), I definitely want to try it coz I luv cheesecakes. Before I would just go to Cheesecake Factory buy a slice or two with nuts on it and yes, I bought a whole cake, a huge one and its frozen. Looking forward to bake one, hoping it will be heavenly and to die for, Thanks Ashlee Marie! you are so welcome! I hope you try many of my cheesecake variations I’ll add a few more flavors this year too! I’m completely obsessed with cheesecakes! Is this really 3 lbs of cream cheese, so 6 8 oz packages? Made this cheesecake like 2 weeks ago and I will never buy store bought or restaurant cheesecake again, absolutely no comparison. This is the most rich,thick and delicious cheesecake I ever tasted. Patience is key with the cooling process. Let it cool in the oven after baked with the door slightly opened for an hour, then on the counter for like 2 hrs, then in the fridge overnight. I added the optional lemon juice with gave it the right kick! Do you mean a weighted 3 lbs, or 3 bricks? yay! so glad you like it! I obviously love it, and I’m tickled so many people love it like I do. Would it still taste as good with a graham cracker crust? of course! any crust you want! I simply love this recipe!! 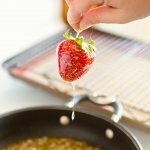 Can you tell me if there is any way to replace eggs in the recipe? nope, not and get the same results. I’m sure there are eggless recipes out there but of course it will change the texture quite a bit. 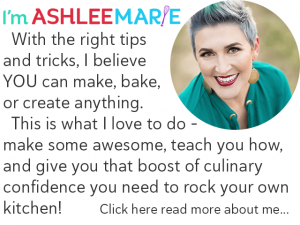 Dear Ashlee i love to watch all of your video.So awesome and i going to try making cheesecake next week.If follow your instruction sure be great.Thank for nice recipe and good tip too. I hope you loved it as much as we do! cheesecake is the BEST! What are the measurements if I’m using a 9 x 3 inch springform pan? I baked with a 9-inch springform pan and I used 80% of everything. you can cut it by 1/3, but that will be much shorter than it is now, cutting it by 1/4 would be better – but it doesn’t cut by 1/4 as easily as 1/3. I’m Making this cheesecake right now. I am so excited for it to be done! I’ve been searching for the best recipe! This might be it! I’m making it for my husband’s camping trip with his guy friends! It looked so thick and rich when making it! Thank you so much for the recipe! I love this recipe. It’s amazing. I love the dense creaminess. I want to make a pumpkin cheesecake that is the exact same density and creaminess as this. Any suggestions how I can make this recipe a Pumpkin Cheesecake? Hi! First I would like to say that this recipe is what I’ve been searching for! I can’t wait to try it! Second, what kind of mixer are you using in the video? I have never seen one like that and it looks pretty neat. Thank you! 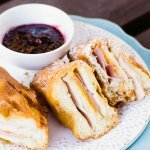 Can I make little mini cheesecakes using a muffin tin, using this recipe? If so, how can I adjust the cooking time/temperature? Is there a way to make this a pumpkin cheesecake? Thank you so much for posting your video on how to create any flavor out of cheesecake. I made your recipe and chose pumpkin for my flavor. It was absolutely delicious. Everyone loved it! Question: My ultimate cheesecake texture is that of what you get when you go to an Italian restaurant, or any quality restaurant for that matter, and its texture is like running the fork through actual cheese (not rock hard or hard hard cheese); like those perfectly smooth, somewhat melt in your mouth chocolate truffles that are just chocolate and cocoa on the outside. And it’s decently similar to this when eaten. Neither dry nor chalky, but smooth and moist as your mouth begins to melt it, enjoying each bite. It doesn’t crumble, or flake; nor does it look like that moist, grainy style, softer, but not super airy, baked cheesecake that most people make and call a New York Cheesecake. It’s ‘not’ slightly gelatinous, ‘not’ custardy. When sliced it’s smooth at the exposed edge, like a smooth medium-hard cheese – with no visible texture to the slice; or very little (think flaky knife drags, like sliced parmesan), depending on knife skills and the use of a wet, slightly warmed knife. 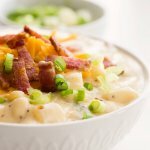 I always thought it was that, a NY style, but I’m not so sure in looking at countless recipes. Does any of this sound like a cheesecake you have eaten, or ring true to a cheesecake enthusiast such as yourself? Everyone says their recipe is dense, or dense and creamy, etc.. but they always look like what I “don’t want”. Is that this recipe, or maybe another you have? Oh, and the music playing through the whole video, I find it detracts from your sunny, viewer grabbing personality. Maybe just selective spots where it’s played, and more variance, longer loops? Super good videos though, the best are like this one where they’re interactively narrated as you’re doing it almost live, as opposed to the ones where you stand and talk, then show the shots like the Hawaiian Rolls video. Both good, this one’s nicer to watch, feels like a personal: in-the-kitchen tutor. LOVE THAT!! You’re good at that. Shine!! I have made this recipe at least 4 times now and it is absolutely the BEST cheesecake I’ve ever had. Thank you so much for posting… it gets rave reviews every. single. time. It is awesome! Just thought I’d let you know. Thanks again! Just curious what topping you used, (to get the rave reviews)? yay yay yay yay! thank you so much for taking the time to let me know! I’m so glad you enjoy it as much as we do! I’ll give it a try. A co-worker once brought a cheesecake to work to share around the Holidays. It had been presliced into about 3/4″ slices. I was thinking is that all we’re suppose to get. But, after enjoying that very small slice of cheesecake I was completely satisfied. It was so rich, creamy and dense and did I mention delicious that you just didn’t want anymore. I asked about the recipe and was told it was a handed down family secret. Well 20+ years later I’m still looking. People feel that way about my flourless chocolate cake too – it’s SO RICH and so dense that when I cut little slices people think I’m being stingy… until they try it and get full. let me know what you think when you try it! What is that little spinning egg beater called? I’ve never seen that before and can’t wait to get one! I am curious what brand your mixer is, I have never seen one like it. I love my Kitchen Aid. but yours looks like something I would like to use. I am also interested in the gadget you used to lightly mix the eggs and where you got it. Your cheesecake looks wonderful. Next time I want or need a cheesecake, I am making this one. Thank you for all the tips and posting. The cheesecake looks incredible!! I’m definitely going to make this one. It’s close to my recipe, but just different enough that I HAVE to try it. Plus! I want your kitchen tools! Where can I get that mixer? Ashlee Marie, could I sub coconut flavoring for vanilla in this recipe? it was a “magic whisk” honestly it broke right after I made this video – i didn’t bother replacing it.